Fischer Heating & Air Conditioning offers a full range of services for the residential and commercial heating ventilating and air conditioning customer for the entire metro area! Please click on the services tab for full details and to schedule an appointment! Whether your home or office is too cold or too hot, Fischer Heating & Air Conditioning offers the heating, cooling and HVAC services to get you back in your comfort zone quickly and affordably. We have been serving residential and commercial customers since 1985 with superior products and professional, ethical service. Over the years, heating and cooling manufacturers have continued to improve their products, and Fischer Heating & Air Conditioning has kept pace by continually working to offer our customers the most effective, energy-efficient HVAC products available. Fischer Heating & Air Conditioning believes that a company is only as good as its people, and our people have made us one of the most trusted and respected heating and air conditioning companies, by always going the extra mile to provide our customers with unsurpassed service. We offer energy rebates to our customers! "John has completed a number of HVAC projects for us, including installing a new high-efficiency Coleman furnace, and we have been thoroughly satisfied with all of his work. Not only is he technically savvy and efficient with his installations and clean in his work, but he is always warm and personable, and willing to take the time to discuss various solutions for projects with us." 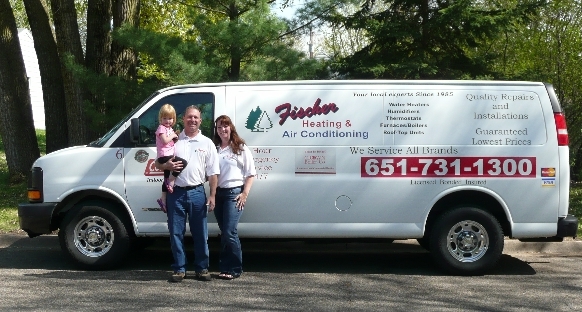 "Fischer Heating and Air Conditioning services both of our sites in Little Canada and Chisago City. They do everything from new installs, service work and preventative maintenance. They are always prompt, knowledgeable and the prices are very fair. We would recommend them to everyone."